Do you want to get your career in nutrition off to the right start? Do you feel as if you have lots of theory knowledge but feel stuck in actually applying what you have learnt? Do you find when applying for jobs you need experience but don’t have any? Places go on sale Friday 20th March at 10:00 GMT. Places are limited to 20 as we are keen for this programme to remain highly intensive, allowing more 1-2-1 contact to the Mac-Nutrition Team for personal support and mentoring as well as plenty of time for questions and discussion. "Just booked onto the @MacNutrition Mentorship! No 'knowledge bombs' in sight! Just actual science." We can help to strengthen your career, show you how to apply your knowledge efficiently and effectively and most importantly we can show you how to get results with every client! So if you are interested in getting ahead of your competitors, make sure you keep reading! This Mentorship will teach you exactly how we work with our clients and athletes to offer an industry leading service so that you can do the same! Our nutrition course has been specifically developed to allow students studying nutrition, dietetics, personal training, sports science or a related area (or have been within the last 6 months), to gain a unique insight into delivering high end nutrition support. 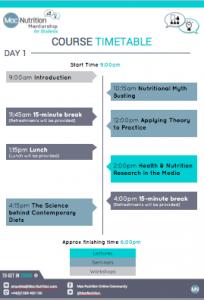 The weekend combines nutrition seminars, lectures and practical workshops, as well as resources to go away with, to give you a hugely applied focus complimenting theory learnt within your taught education programme. 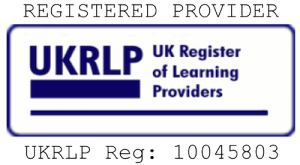 The skills learnt will allow you to offer the highest level of service to those you work with. 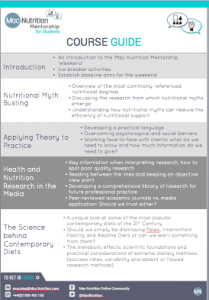 We will provide all successful applicants with some optional pre-nutrition course reading material prior to the start of the weekend so that everyone attending can start off at the same place. The mentorship weekend will teach you what you don't necessarily learn in the classroom; how to work with real-life people in the real world! Discover in detail how we work with our clients; we will reveal our company secrets, knowledge and practice and we will give you resources that we ourselves use with our clients so you can do the same! … which will make you more sought after and respected in the industry and make you more profitable! … so you can create your own successful experience and either become a successful self employed practitioner or become more desirable so you bag that sought after job! What's the difference between a Mentorship and an Internship? Find Out Here! What else will I get for my money (£299)? Will I need to prove I am a student? Yes, you will need to provide a student card or proof of enrollment on a full time course. We will accept those who have finished a course in the last 6 months. Below you will find our downloadable application form, time table and module outline. If you want to receive updates about our Mentorship programmes specifically, enter your details below.